So is Episode 7 out yet? It’s officially four days (technically three if you count the Thursday night screenings) until The Force Awakens is finally released so we decided to do a drawing a day of some of the characters getting their cosplay on. First day goes toward the Stormtroopers who completely misread Wayne Gretzky’s “you miss 100% of the shots you don’t take” mantra. "If you enjoy the story, it’s an easy and relatively inexpensive way to keep it going. Take the $15 you would have spent on the new un-inclusive Cinderella or questionable casting of Exodus: Gods and Kings and become a patron of a new artist instead. Revolutionary Times creators Brandon Howard and Sean Mack are more likely to need and appreciate your support than Ridley Scott." efinitely check out the article and our fellow webcomics brethren. And also keep Black Nerd Problems bookmarked because it's an amazing site that's more than needed. Afternoon, revolutionaries! The Society6 page has been updated! We finally have a print version of "The Unarmed" strip on sale, along with the print of the first "Hollyweird" poster from yesterday as well. And yes, we can also apparently have our arts on shirts now too (only up to 2X though. Yeah, Sean's not happy with that either). So if you're an art enthusiast, go cop some art for us. We'd appreciate it! We also have the art up for sale as a print on our Society6 page as well! Well summer's here and trust us, we're still around as well. Brandon and I are still in the lab cooking up new ideas and comics that will be up very soon. 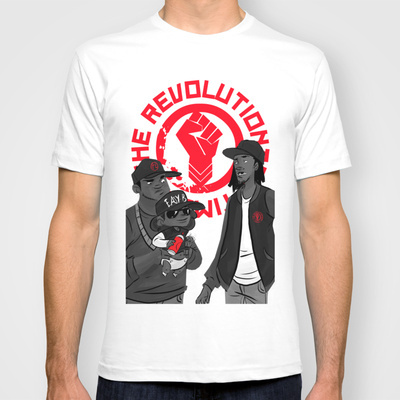 In the mean time we thought we'd drop this new "Spread The Revolution" illustration on you that also gives you a sneak peek at a trio of characters (well, there's two seen right now) that will be popping up in the comics very soon. Get your cupcakes ready and enjoy the summer, Revolutionary Times style. This illustration is also up for sale as a print over at our Society6 page as well so if you feel so inclined go ahead and cop one for yourself. And as a bonus, check out the process behind the scene of the making the art itself!